Up until the seventeenth century, young babies were tightly wrapped in swaddling clothes and carried to the font in a "bearing cloth". This was a large square piece of silk, edged with trimmings of gold lace and braid. The Christening gown, as we know it today, evolved in the mid-eighteenth century when babies were freed of swaddling at an earlier age. In white silk, the earliest surviving examples have a front opening which was either fastened with ribbon ties or left open to show a petticoat beneath. The decorative curving lines of braid are similar to those applied to women's gowns of the period. 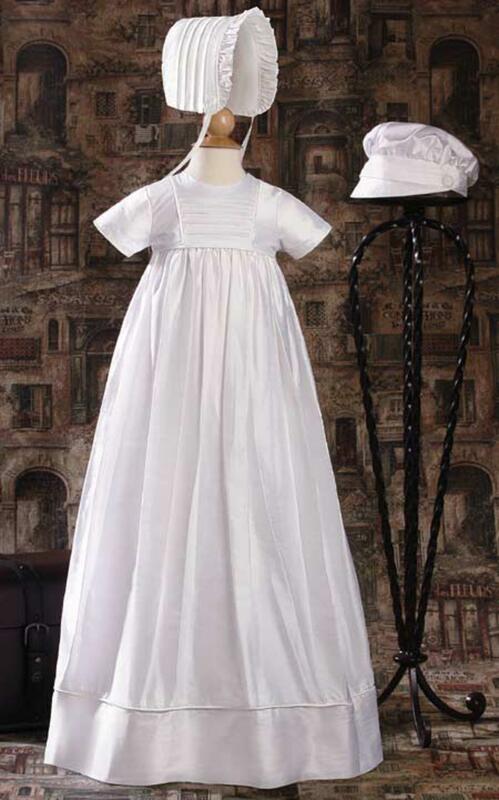 The first Christening gowns were made in the style worn every day by eighteenth-century children: both boy and girl babies wore "slip" dresses, with a very long, flowing skirt falling from a short, tucked bodice and a low neck and short sleeves. Other items of clothing such as bonnets and bootees could be made to go with the robe. A number of exquisite Christening sets survived from the seventeenth and eighteenth centuries, including bibs, head bands, mittens and pincushion covers or handkerchiefs in embroidered linen. Victorian babies were dressed in gowns decorated with Ayrshire work, a delicate form of white-on-white embroidery that originated in the Scottish Lowlands. An old Scottish custom involved pinning a piece of shortbread to the Christening gown, to be worn throughout the ceremony. An unmarried girl who ate the shortbread afterwards was sure to dream of her future husband that night. It was also thought essential for the baby to sleep in its Christening gown for the first night after baptism, to bring luck and good health in the future. The same fashion has remained popular for Christenings ever since. This is partly due to the tradition of handling Christening gowns down from one generation to the next, so that dozens of babies may wear the same gown over many years. If there’s no antique gown in your family, you can create an heirloom for future generations with a gown from our range which has been made in the traditional method in fine natural pure silk and cotton, embellished with delicate embroidery and tucking.